^ D. Edwards; Feehan, J. (1980). 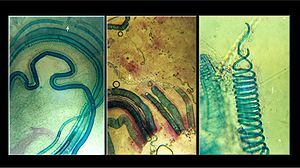 “Records of Cooksonia-type sporangia from late Wenlock strata in Ireland”. Nature. 287 (5777): 41–42. doi:10.1038/287041a0. ^ Parfrey, Laura Wegener; Lahr, Daniel J. G.; Knoll, Andrew H.; Katz, Laura A. (August 16, 2011). “Estimating the timing of early eukaryotic diversification with multigene molecular clocks”. Proceedings of the National Academy of Sciences of the United States of America. 108 (33): 13624–13629. doi:10.1073/pnas.1110633108. PMC 3158185. PMID 21810989. “ITIS Standard Report Page: Tracheobionta”. Retrieved September 20, 2013. ^ Christenhusz, Maarten J. M.; Reveal, James L.; Farjon, Aljos; Gardner, Martin F.; Mill, R.R. ; Chase, Mark W. (2011). “A new classification and linear sequence of extant gymnosperms” (PDF). Phytotaxa. 19: 55–70. doi:10.11646/phytotaxa.19.1.3. ^ a b Smith, Alan R.; Pryer, Kathleen M.; Schuettpelz, E.; Korall, P.; Schneider, H.; Wolf, Paul G. (2006). “A classification for extant ferns” (PDF). Taxon. 55 (3): 705–731. doi:10.2307/25065646. JSTOR 25065646. ^ Christenhusz, Maarten J. M.; Zhang, Xian-Chun; Schneider, Harald (2011). “A linear sequence of extant families and genera of lycophytes and ferns” (PDF). Phytotaxa. 19: 7–54. doi:10.11646/phytotaxa.19.1.2. ^ Pryer, K. M.; Schneider, H.; Smith, AR; Cranfill, R; Wolf, PG; Hunt, JS; Sipes, SD (2001). “Horsetails and ferns are a monophyletic group and the closest living relatives to seed plants”. Nature. 409 (6820): 618–22. doi:10.1038/35054555. PMID 11214320. ^ Pryer, K. M.; Schuettpelz, E.; Wolf, P. G.; Schneider, H.; Smith, A. R.; Cranfill, R. (2004). “Phylogeny and evolution of ferns (monilophytes) with a focus on the early leptosporangiate divergences”. American Journal of Botany. 91 (10): 1582–1598. doi:10.3732/ajb.91.10.1582. PMID 21652310. Cantino, Philip D.; Doyle, James A.; Graham, Sean W.; Judd, Walter S.; Olmstead, Richard G.; Soltis, Douglas E.; Soltis, Pamela S.; Donoghue, Michael J. (1 August 2007). “Towards a Phylogenetic Nomenclature of Tracheophyta”. Taxon. 56 (3): 822. doi:10.2307/25065865. JSTOR 25065865. Kenrick, P. (29 June 2000). “The relationships of vascular plants”. Philosophical Transactions of the Royal Society B: Biological Sciences. 355 (1398): 847–855. doi:10.1098/rstb.2000.0619. PMC 1692788. PMID 10905613.